GNUF DAY 2! 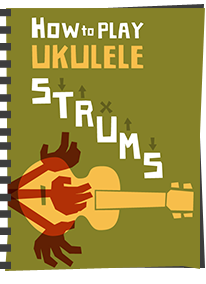 Well, as you read yesterday, Day 1 at the Grand Northern Ukulele Festival was a blast, even if it did find me posting my diary report through the fog of a hangover... 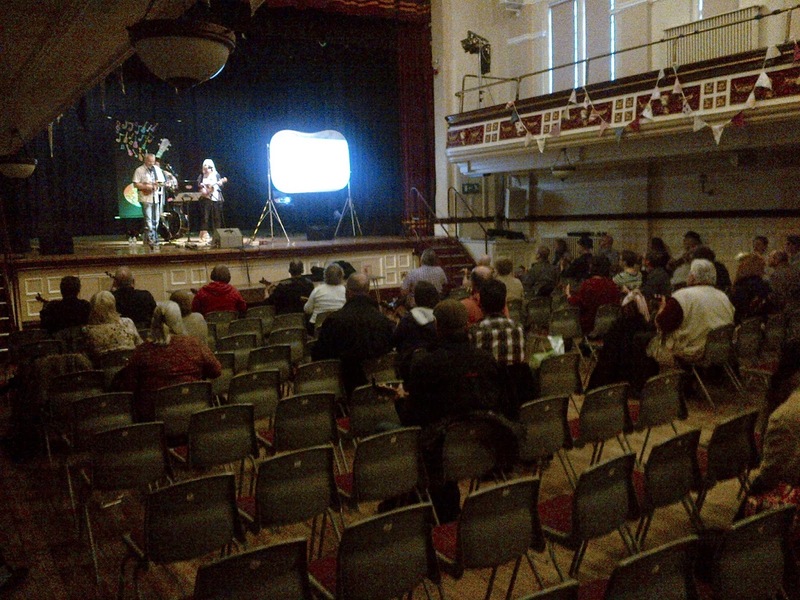 But with that blog posted and some breakfast wolfed down, it was back to Pontefract Town Hall for Day 2 - could it be even better? So in we go and some more hello's to new faces and a chat about the day before with old. I suspect this blog post will serve to be a little more reflective than Day 1, mainly because I have more time to write it! But on that point, the common theme people seemed to agree on about GNUF - it was about as friendly and inclusive as a festival or get together could be. Everywhere you turned, people were smiling, chatting and making new introductions. Had a real nice 'feel' to it. I popped back in to the Grand Bazaar stall area which had changed around a little. 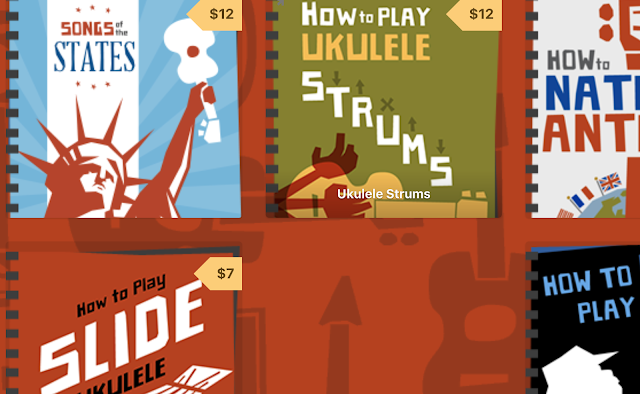 The guys at Southern Ukulele Store needed to head back the day before, but Omega Music had expanded their stall (or so it seemed) and were having a great day, including selling a Godin Multiuke that you know I like so much. 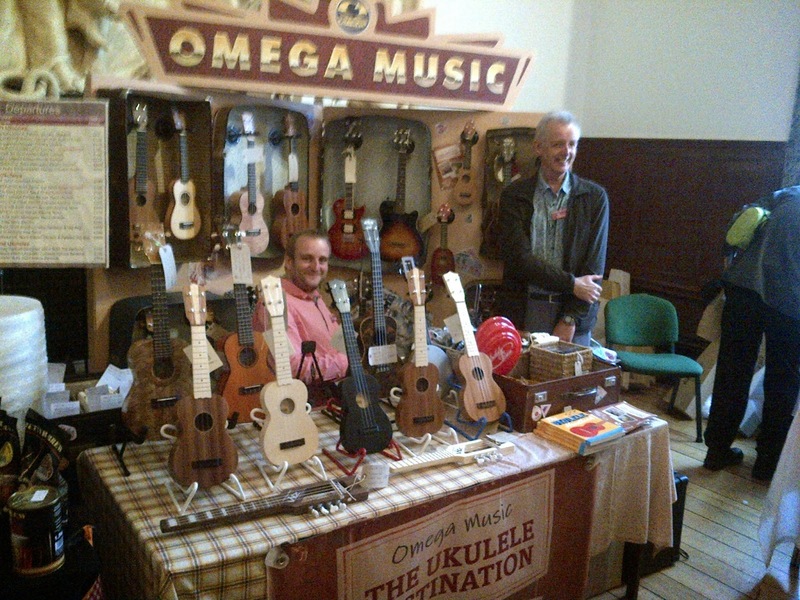 Omega's range of ukes is really starting to grow well and was good to see them as dealers for Bruko and carrying quite a range of their ukes. Meanwhile on the MainStage, Krabbers was leading the 'Unplug The Wood' session to the audience. This is a great idea and stems from what he does with a club at home. On stage were a trio of performers, amplified, and next to them a large projected songbook. 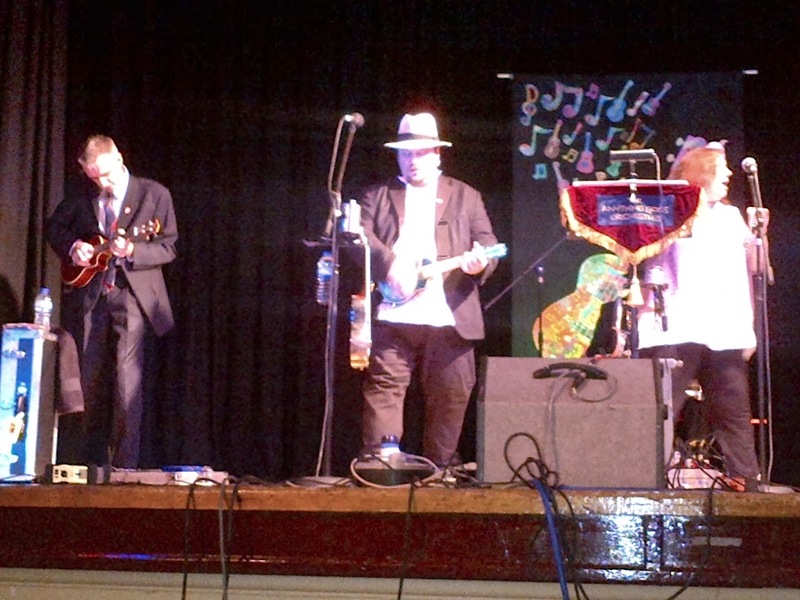 They led the singing and playing and the audience joined in - kind of the perfect club jam but on a huge scale. 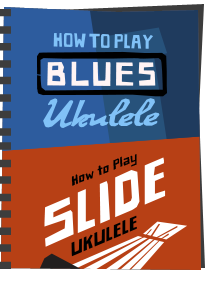 It went down really well and I thought the choice of songs was inspiring as it was miles away from the usual ukulele songbook which seems to be repeated through so many clubs. 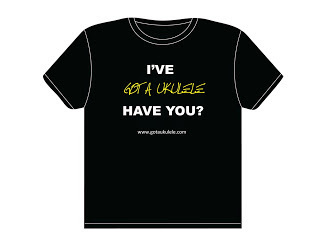 Next up, and possibly with the award for the greatest band name ever were the Leeds duo that are 'Ukulele Bitchslap', delivering a witty set of ironic / sarcastic covers which had the audience smiling. Nicely done. Some more time now mooching around the venue and catching up with people. And yet again, everyone you spoke to was reflecting on what a great event it had been. Those stalls really are alluring, and over the weekend arranged with Matt at Saigon Guitars to take a look at his Noah Ukes on Got A Ukulele (watch this space!). It was also good to see some new traders such as Eagle Music and a homebrew beer stall! 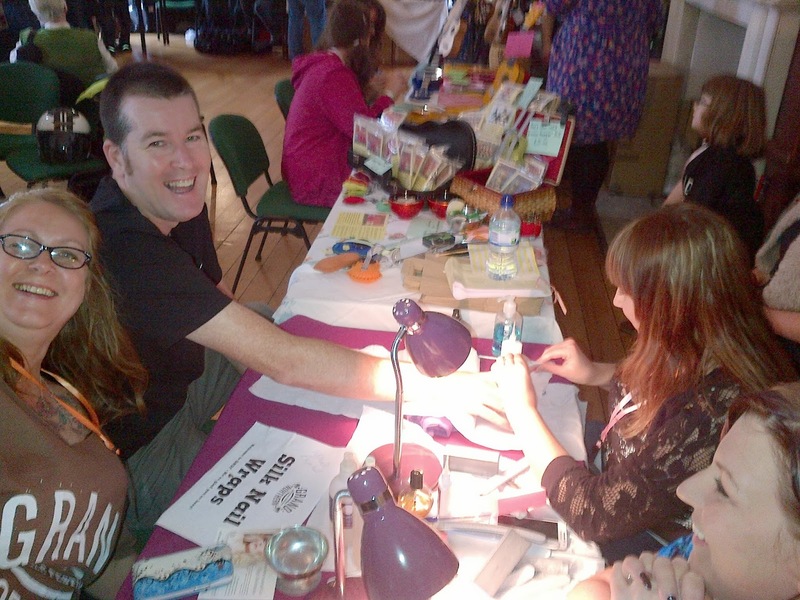 And what a genius idea it was to get a nail bar at a uke festival! 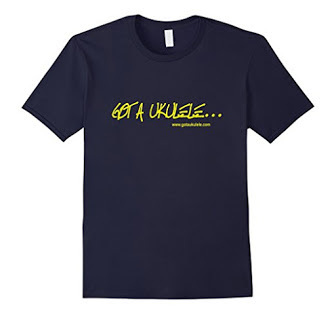 They did a roaring trade, and were christened Ukunaile by Clarice Wokes! 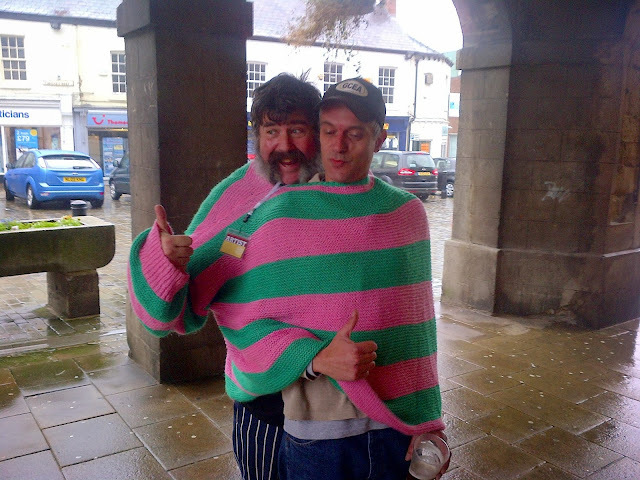 Outside I spotted the compere for Day 1, Martyn 'Eek' Cooper being told by Uke Box's Marko van der Horst remarking that his oversize jumper didn't quite fit... He then quickly saw to that! A word about the compères for the weekend. It's essential to get good people to this job, to keep the thing moving between acts and inject some humour into proceedings. They did that in spades, and really entertained the crowd. Special mention goes to Heidi Bang Tidy, the queen of burlesque who compèred the second day. She was funny / naughty and just great to listen to. 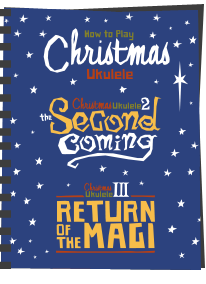 Oh, and she was also responsible for calling out the raffle prize winners in which I bagged a rather nice thin body Ohana Tenor uke!! (People - there is a comments box below for you to deliver the jealous notes..... just kidding). 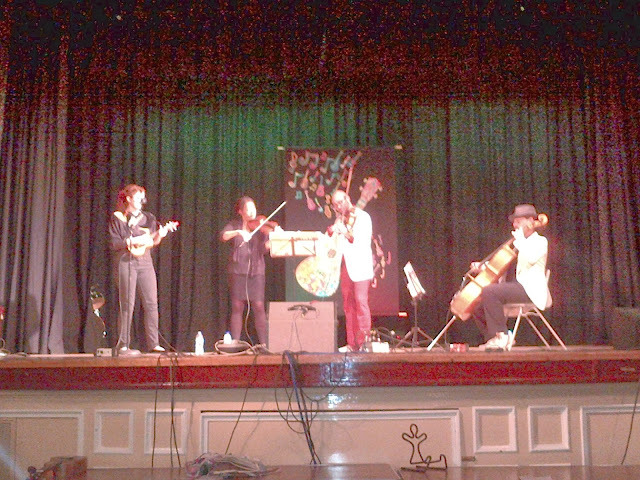 Back in the main hall, Emily Scott delivered a quite beautiful, laid back, melancholic set, accompanied by strings which was rather nice and had those 'pin drop' moments going on in the hall. Emily is based in Glasgow and is worth checking out. And before you know it, it was time for the final act to close the festival. 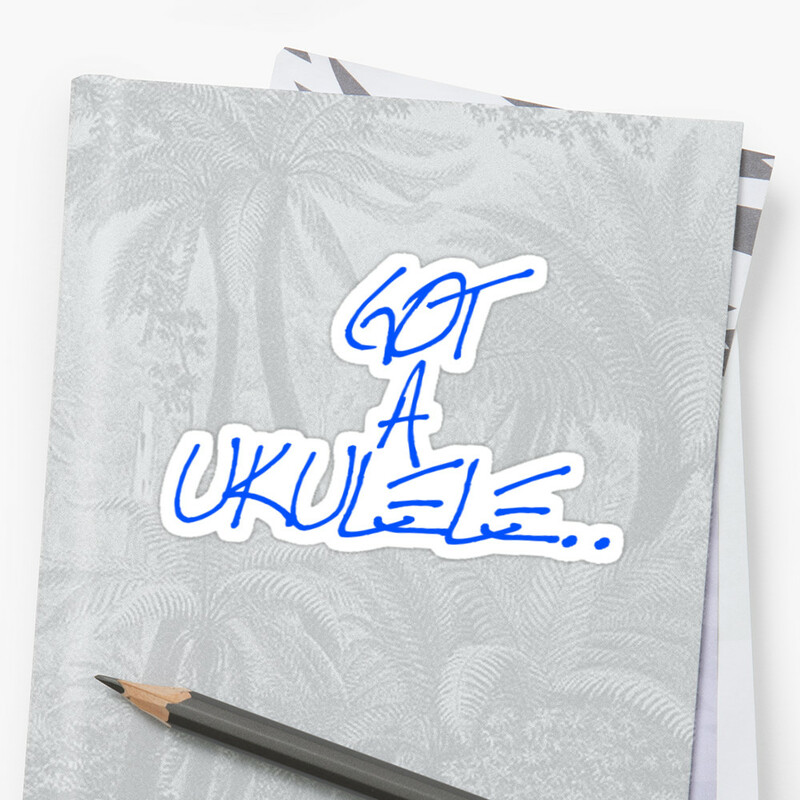 For that you need something that is going to send people home with a bang. Boy did the organisers deliver on that front. 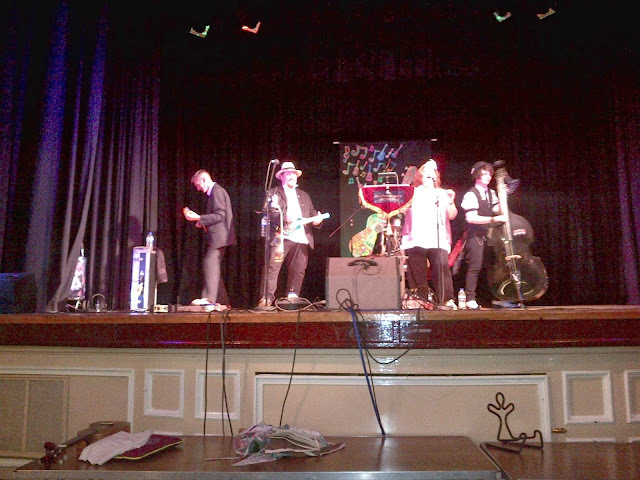 To the stage came Sheffield based five piece The Anything Goes Orchestra. 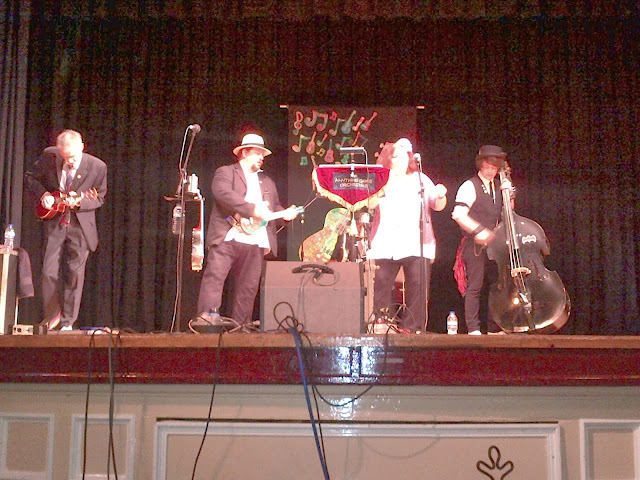 This is a band who play a range of songs with a leaning towards more old time numbers delivered with fire and style. And the audience got that by the bucketload. From the first track the whole room was jumping, punters were jiving in the aisles, clapping, singing along. Their stagecraft is just superb and you can see them really enjoying themselves, ribbing each other during songs and generally having a great time. And it's quite beyond my how Jake 'The Shake" Smithies manages to play double bass so well and so tightly whilst doing everything with it apart from swinging it around his head - brilliant. And to top it all off, they finished their set to a raucous, noisy, footstamping call for an encore that the organisers just couldn't ignore despite working to a tight deadline. What more can I say? Well, I am going to stick my neck out here: I loved Day 1, and there were some stellar performances, but the TAGO set was, for me, the act of the festival - I could have watched them all night, and I'd urge you to try to see them if you can. All good things must come to an end, and the stage then filled with the performers from the weekend, together with organisers and volunteers to lead the whole room with a playalong. 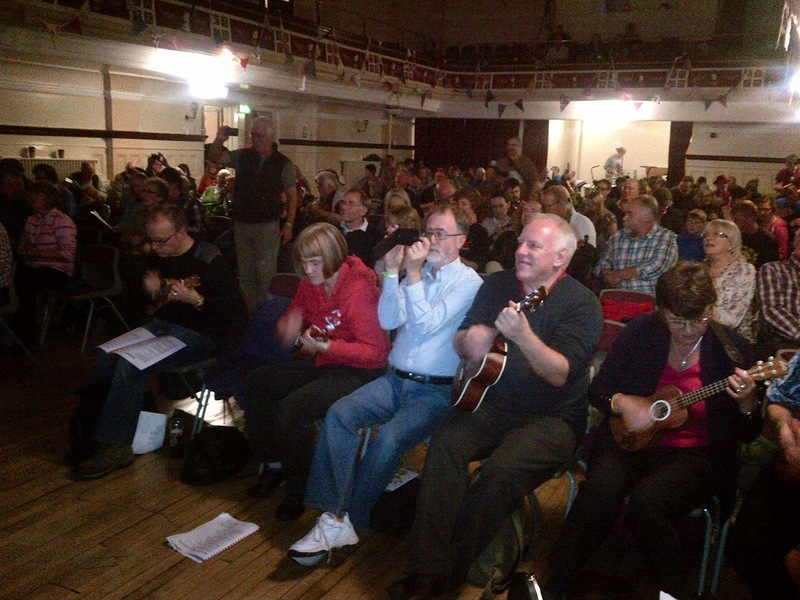 Led by Phil Doleman, the whole room joined in to the Beatles 'Little Help From My Friends'. What a great end. Out on to the drizzly streets of Pontefract, hugs and goodbyes to friends old and new, getting jostled by people carrying workshop diddly bows and washtub basses, a smile on every single face. In my opinion, a total success. And as something that just developed from a conversation organised by Mary Agnes Krell, she and her team should be completely proud of themselves. They pleased the audience, they worked tirelessly behind the scenes in the months beforehand to bring it together. They also worked with local charities to put something back into the community such as the Pontefract Miners Recreation Charity and Faceless Arts. So a thank you from this blogger to Mary, Tony Casey, Rob Collins, Lou Armer, Paul McCann and Kris Ball, as well as all the volunteers who helped you (yes that's another mention to you Clarice Wokes!). Same time next year? Yes please! Oh well, what little street cred i had has now gone out of the window, lol. Nice to meet you Baz, and enjoyed your rundown on events - shame I only got a sneaky peek at most of the stuff going on (dutifully manning my stall!). But good to hear about it through your excellent report! You're right about the dazed heads LOL. 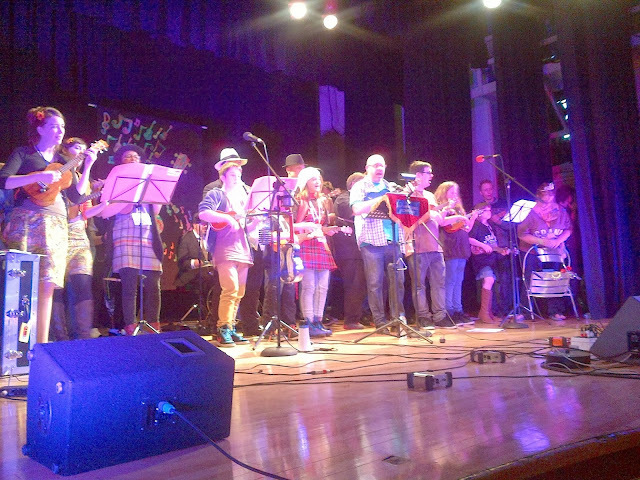 The Anything Goes Orchestra were absolutely superb.